ICC Cricket World Cup 2019 is scheduled to begin from May 30, 2019, which will take place in England and Wales. This will be the 12th edition of the Cricket World Cup. 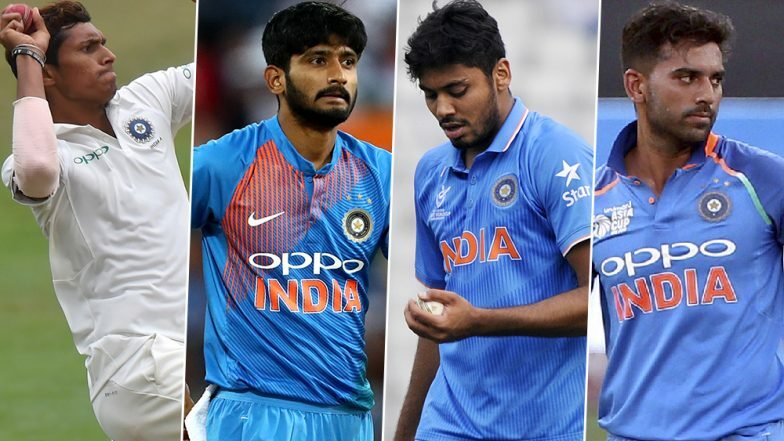 Board of Control for Cricket in India (BCCI) chose Khaleel Ahmed, Navdeep Saini, Deepak Chahar and Avesh Khan as India's net bowlers in World Cup 2019. Vijay Shankar Included in Team India for ICC Cricket World Cup 2019, Check Full 15-Man Squad. BCCI has announced 15 men squad for ICC World Cup 2019 on April 15, 2019. Few Indian Cricket fans got disappointed on Vijay Shankar selection instead of Rishabh Pant. Meanwhile, speaking about Indian pacers for the upcoming World Cup, India will have three main pacers Mohammed Shami, Bhuvneshwar Kumar and Jasprit Bumrah. Indian selectors felt that they should send some net bowlers to assist the Indian Cricket Team during their World Cup campaign in 2019. Will MS Dhoni’s 'Reference' Help CSK Pacer Deepak Chahar Seal a Place in the Indian Squad for ICC Cricket World Cup 2019? Post squad announcement for ICC World Cup 2019, BCCI said in a statement hours that, '"The players will assist the Indian team in its World Cup preparation". The four net bowlers selected for World Cup 2019 play for different teams in IPL. Navdeep Saini plays for Royal Challengers Bangalore, Deepak Chahar is star CSK bowler, while Khaleel Ahmed and Avesh Khan play for Sunrisers Hyderabad and Delhi Capitals respectively. ICC Cricket World Cup 2019 Schedule in PDF: Ticket Prices, Dates, Venue Details & Timetable Available for Download Online. India will play their first match of ICC World Cup 2019 on June 5, 2019, against South Africa at The Oval, London. The final of World Cup 2019 will be played at Lord's on July 14, 2019.